(BPT) – The evolution of American families and their changing lifestyles is a popular topic these days. As family dynamics and lifestyles morph, they drive a change in home design. Aside from the enduring presence of a TV and seating, today’s living room looks and functions very differently from living rooms of just a few decades ago. Today’s living rooms feature a multitude of state-of-the-art technology. Stunning televisions, slim speakers, ultra slim laptops and tablets are a must in today’s living room designs, and because there are so many options and colors to choose from, families can seamlessly integrate technology to enhance the function and design – even in traditional homes. “New colors like rose gold laptops and vintage orange portable speakers create new opportunities to add personalized touches, while striking new television design, like LG OLED TVs, make a stunning statement piece,” Marks says. 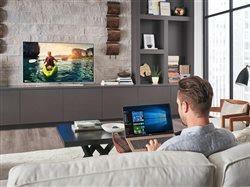 Connected devices like Smart TVs are transforming how people consume content. Advances such as the webOS Smart TV Platform offer new features like “Channel Plus” for simple access to channels including BuzzFeed, Esquire and more. And, as the first TV to support both available HDR formats – Dolby Vision HDR and HDR10 – OLED smart TV users can stream the newest HDR titles from leading content providers like Netflix, Amazon Video and VUDU. Formal living and dining rooms that are never used are a thing of the past, Marks explains. TV still remains king; Mintel reports 99 percent of American households with children younger than 18 have at least one TV in their home. However, families are using spaces like living rooms to serve multiple functions, including entertainment and work, researching and making purchasing decisions, and communicating with distant loved ones. According to a recent Mintel study, more than 80 percent of millennials shop for clothing apparel online and more than 67 percent have “binge watched” a TV series, ranking it as their top online TV viewing behavior. Devices such as the feather-weight LG gram 15 laptop, clocking in at a mere 2.2 pounds with a large 15.6-inch screen, make it easier than ever to transition from the office to the living room while also providing enough screen space to multitask between work deadlines, watching your favorite sporting event and late-night online shopping. “With the popularity of wireless devices and smart homes, homebuyers and real estate developers alike now have a stronger interest in creating spaces that seamlessly integrate advanced technology in ways that will enhance the space, and simplify a buyer’s life,” notes real estate trends specialist Ricardo Rodriguez of Coldwell Banker Residential Brokerage. At the same time, people remain concerned about the high initial set-up costs and perceived complexity of connected homes. Professional installation of consumer electronics products has remained a rare occurrence, even among higher-income households. In fact, in a recent Mintel study, only 10 percent of respondents had ever paid for custom installation of electronics. Instead, consumers prefer DIY (do-it-yourself) and plug-and-play home monitoring solutions with home automation capability, like the Smart Security from LG and ADT, which represents an easy-to-install approach that gives families greater control over how they protect and control their homes. “Product design is so streamlined and visually appealing that consumer electronics are no longer the elephant in the room; they’re often the star. Stylish interiors are enhanced by smart technology, and that’s really having a transformational influence on modern living room design,” Marks says.